In this project the actual tree in question is no longer a natural species, but has gone through several evolutions of artificial selection. These specific trees that are today growing in the fields of Denmark originated from seeds that have been collected in Caucasus forests. 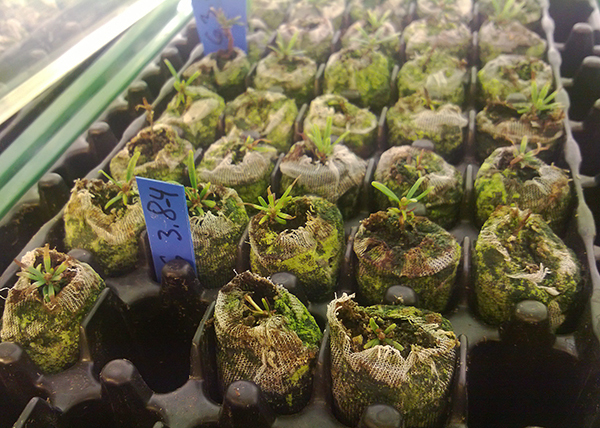 Previously, Christmas trees were growing from seeds hoping for exemplary trees with seeds to be used for the next generation of elite trees, however today, the process is being improved with development of suitable and efficient cloning techniques at Copenhagen University’s Tissue Culture Lab. Currently, the exemplary individual tree is cloned (with somatic embryogenesis) to produce thousands and thousands of 'perfect trees' for growing in the fields of Denmark targeting the European Christmas tree markets. These trees are designed and replicated to match the customers’ wishes. Our interest is firstly in this type of organism, which is both biological and cultural, and selected based on aesthetical and visual criteria, and secondly in the Danish Christmas tree development in which economic factors play an essential role. The Christmas tree market brings a good amount of money to Denmark through the production of 10 million trees yearly from which only 10% stay in Denmark, the rest are exported to other European countries. 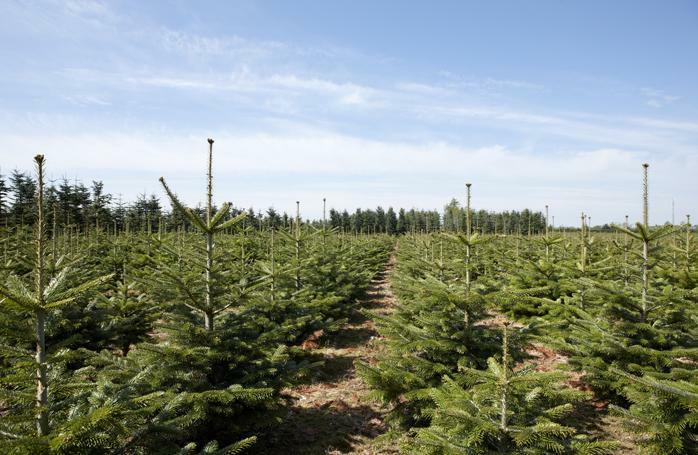 Nordmann fir (Abies nordmanniana), has become a representative of the perfect Christmas tree for Danes and has gained success through its suitability for growing in the Danish climate conditions. It has also become the economically most important tree species in Danish forestry. Currently, this species is being tested and developed for cloning with an aim for improved profit through efficient mass production of Christmas trees. 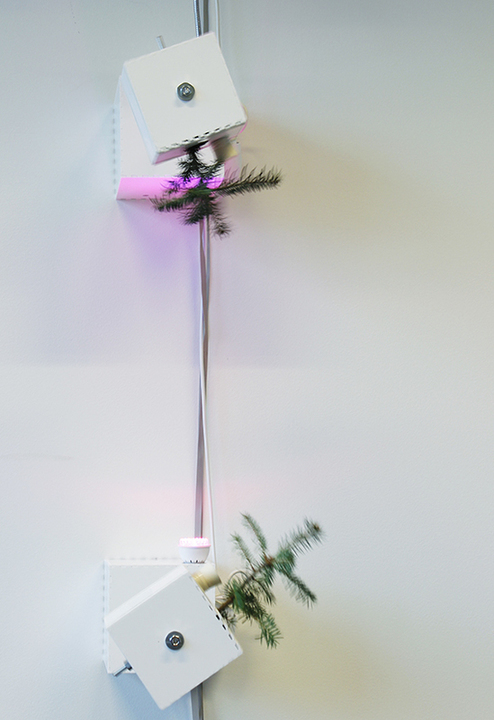 All the trees implemented into the installation are one and the same tree genetically. 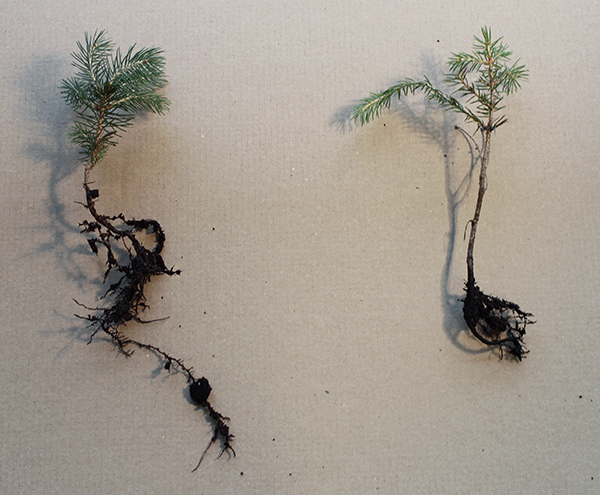 The Condition creates a speculative idea for a forest of the future in small-scale. This forest consists of biological organisms, technology and control, and cultural associations that culminate through economic interests. The work is constructed in the boundary-space of the real (real world, real living organism, real system) and imagined (artifacts, artificial construction, artificial intelligence). It aims at presenting several perspectives and issues at the same time with a goal to push the audience to form emerging questions and thoughts. 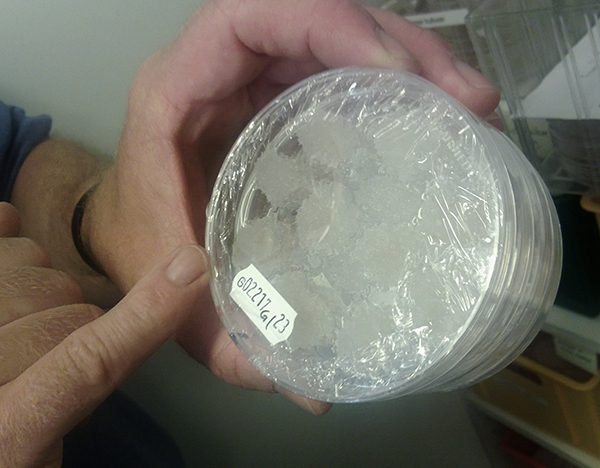 The petridish (pictured below) is full of small embryos of a cloned Christmas tree equal to a whole forest of trees. 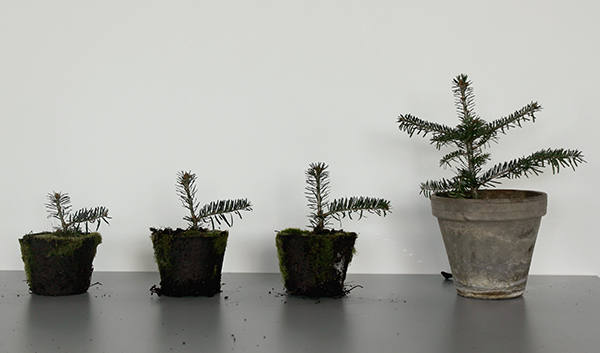 The image is taken during a visit to meet with Jens Iver Find at the Copenhagen University lab, who is developing cloning procedures for Nordman fir trees. The genes of the individuals that are cloned are cryonized meanwhile the tests are done, which will take 8-10 years to grow a full-size Christmas tree. In installation The Condition, Nordmann fir trees are embedded in an installation comprised of rotation boxes, which are hung on the wall in a 3 by 4 matrix structure. Below is a sketch for the installation-in-progress. 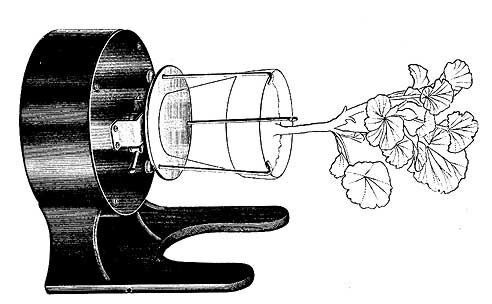 Within the study of plant physiology, rotating plants have a long history, notably in connection with the seminal instrument known as a clinostat. The clinostat uses continuous rotation to negate the effects of gravitational pull on plant growth and development. Commonly the device is constructed to have a plant attached with its stem positioned horizontally during the rotation. This is a historical commercially sold model of Clinostat. In the past, several scientists have experimented with plant physiology and gravitation by using rotational devices. The British botanist Thomas Andrew, for example, described in a letter to Royal Society in 1806 how he eliminated the force of gravity while germinating seeds that he had been rotating both with a vertically positioned wheel and later in experiments with a horizontally positioned wheel. A similar kind of instrument was used by the German botanist Julius von Sachs in 1873, who coined the term “clinostat”. Von Sachs used slower rotation speeds which caused the rotating plant to experience a gravitational pull approximating a weightless environment more closely. The further development of instruments for studying the effect of gravitation in organisms is visible in a three-dimensional version of the clinostat, known as a random positioning machine (RPM). The RPM’s development and purpose are very much in line with the original aims of the clinostat; the simulation of microgravity environments. 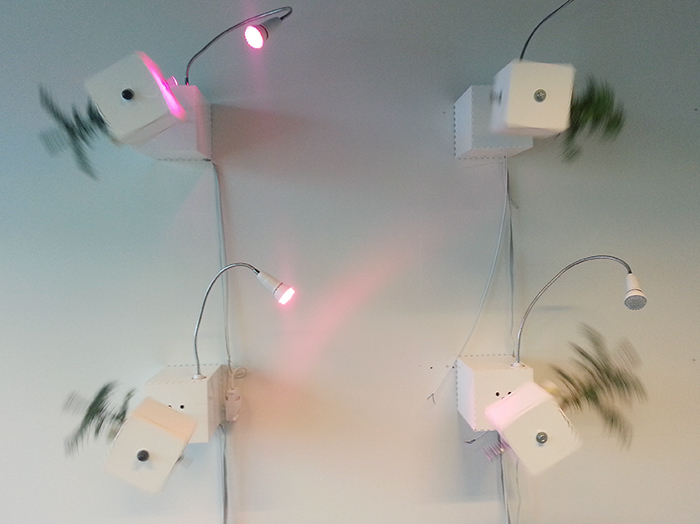 During the summer 2015, we did various tests with rotation and plant growing. 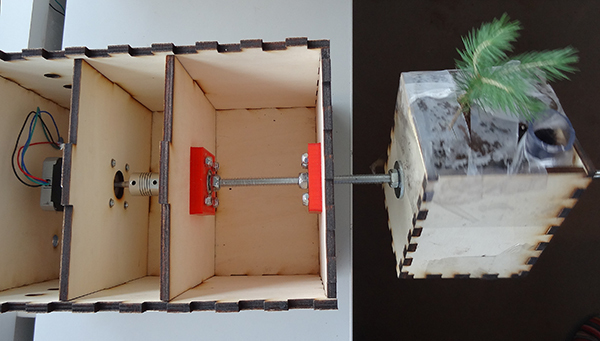 We constructed few boxes for testing rotational movement on plants. However, we put the plant in different direction than what one would normally do with scientific tests with a clinostat. 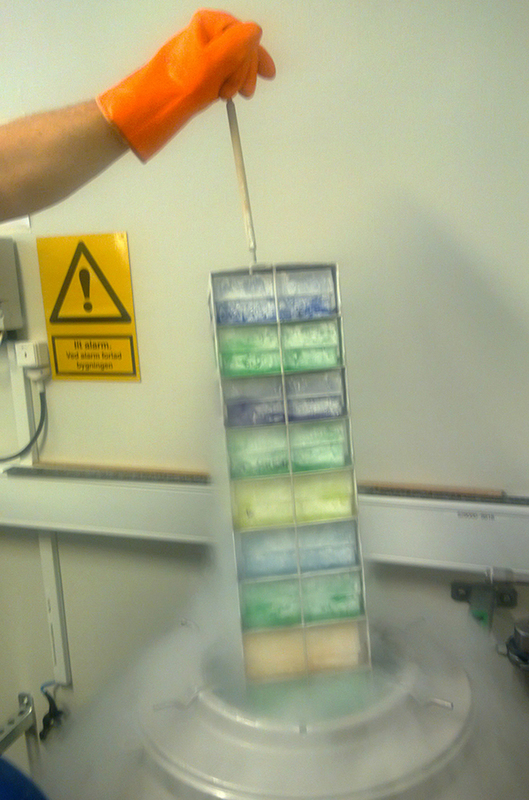 Most of the scientific and few artistic experiments involving plant rotation are related to observing the effects of non-terrestrial conditions on organisms. While space suits and space stations are designed for human survival in space environments, typically by aiming to bring the terrestrial environment with us, these instruments are used to observe the physiological growth and survival of non-human organisms in simulated space-like environments on Earth. They are devices, whose construction relates to a long-term human foresight of possibly living on other planets or under radically different environmental conditions. In the era of the Anthropocene, such speculations still abound, as the conditions on planet Earth could change more drastically over the course of time, than what we currently anticipate. The Condition is guided by the recent insights of plant science that acknowledge the collective character of plant life and does not focus on enhancing or empowering the individual plant. 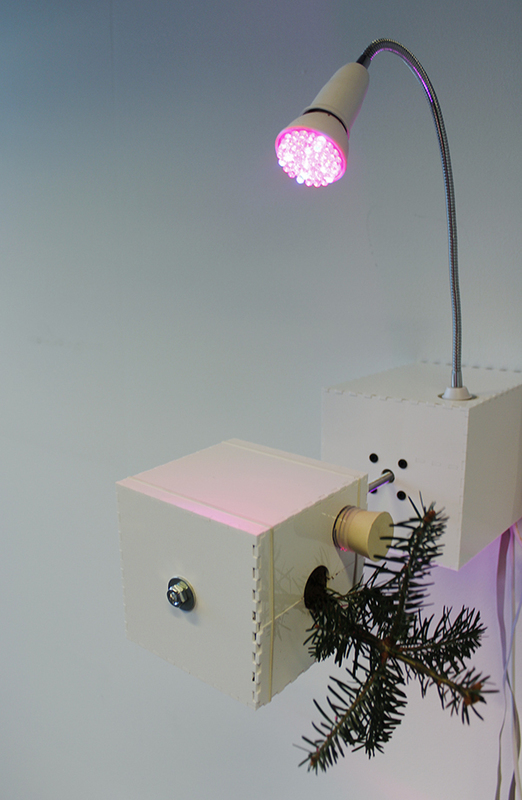 The kind of agency granted to the Christmas trees is intended to be more akin to the group intelligence and behavior. The rotational pattern of the plant boxes is governed by an algorithm known as a Kohonen Feature Map or a self-organizing map (SOM). The SOM algorithm is characterized by being able to learn how to classify information without supervision. The SOM algorithm makes the hybrid setup of plants and technology cohere into an overarching organizational scheme, which is based the novel condition of the plants, in which the constructed artificial intelligence is given to the system, not embedded into individual plants. The Condition is an exploration of an open-ended physical alteration process, brought on by human intervention and technological evolution in conjunction with natural forces. The Condition draws attention to the innate, and often overlooked, sentient, agential and social aspects of plant life. Yet its merger of organic and technological ultimately remains ambiguous and could equally be construed as a perhaps prophetic foresight of a future that is yet to come, where the natural capabilities of plants are no match for technological rationality and all that these organisms might hope for, is a technological scaffolding, that will sustain their most basic needs.